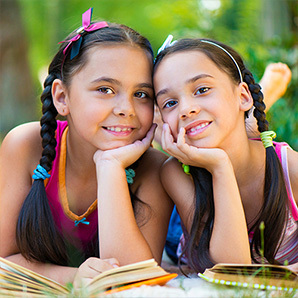 The American Association of Orthodontists recommends age seven as a good time for the first visit to an orthodontist, or earlier if a problem is noticed by either the parents or the family dentist. While a referral from the family dentist is wonderful, it is not necessary to get one in order to schedule an appointment with WingHaven® Orthodontics. If no treatment is necessary at an early age, Dr. Held will monitor young children through their growth stages to make sure dental and facial development remain on track. This monitoring is complimentary and serves to keep parents and guardians in the loop regarding the status of their children’s dental and facial development. If care is needed at a young age, Dr. Held will recommend the highly beneficial two-phase treatment. During the first phase or “early treatment,” Dr. Held can guide the width of the upper and lower dental arches, gain space for permanent teeth, avoid the need for permanent tooth extractions, reduce the likelihood of impacted permanent teeth, correct thumb-sucking, and eliminate abnormal swallowing or speech problems. In other words, treating children during their early growth stages allows Dr. Held to achieve results that not only might not be possible once facial bones have fully developed, but also can significantly simplify later, second-phase treatment. Many parents mistakenly believe that two-phase treatment is just wearing braces twice. That is not accurate, however. Please see the two-phase treatment webpage for more details on the differences between the two phases.